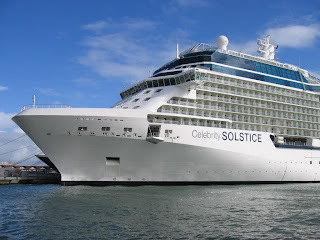 CELEBRITY SOLSTICE at San Juan. Photo Ernie Roller 2008. 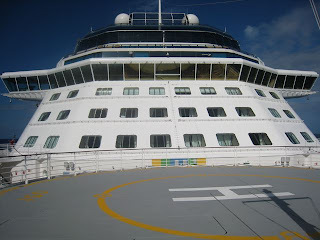 CELEBRITY SOLSTICE at San Juan. Photo and copyright Ernie Roller 2008. Please click on image to open a larger version. All photos by and copyright Peter Knego 2008/9 unless otherwise noted. CELEBRITY SOLSTICE: Not Just Another Mega ShipMost mainstream cruise lines and marine architects have honorably achieved their goals in providing a high level of comfort and functionality in their basic Panamax and Post Panamax cruise ship blueprints while at the same time, economy of scale and updated technology have made these new goliaths more efficient and environmentally friendly. 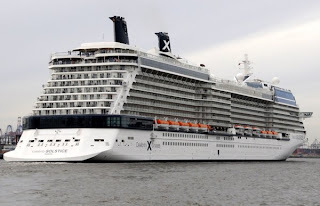 What has been lacking for the dedicated ship lover in this otherwise golden era for the passenger ship, is the “wow” factor of cutting edge design and style. 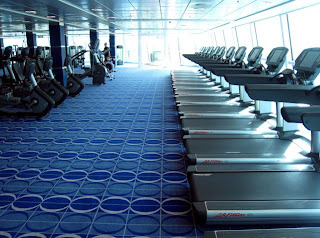 The common platform and a rather traditional and/or repetitive decorative approach (ie ship = Sheraton/Vegas and/or shopping mall) have made most new ships seem like cars or planes. If you’ve seen one, well, you know what to expect when the next one pops off the assembly line. 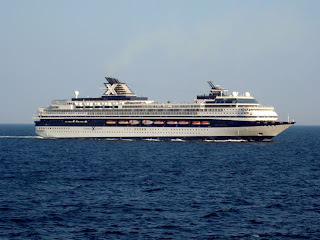 The CENTURY class CELEBRITY GALAXY at speed in the Sea of Marmara, August 2007.One major player that has been the exception to this rule is Celebrity Cruises. 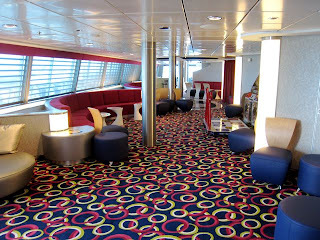 Since the advent of the 70,606 gt, 1,778 passenger CENTURY in 1995, they have built ships with an edgy, modern flair. 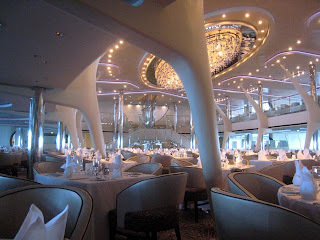 Quality fittings, bold artwork, soaring ceilings and an expensive Meyer Werft finish gave the CENTURY and her slightly evolved sisters, the 76,522 gt, 1,896 passenger 1996 built GALAXY and 1997 built MERCURY, a sense of style and sophistication that eclipsed the competition. The trio was even dubbed the Cyberships for its early embrace of computer technology and fiberoptics as well as its futuristic look. 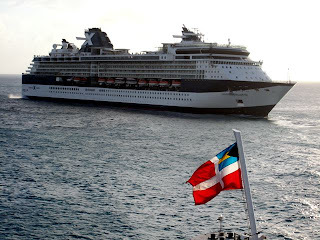 The MILLENNIUM class CELEBRITY CONSTELLATION departs St. Maarten in March of 2008.In 2001, Celebrity upped the ante with the Alsthom-built 90,288 gt, 2,449 passenger MILLENNIUM and her sisters, INFINITY (2001), SUMMIT (2002) and CONSTELLATION (2002), which, in addition to their trend-setting decor and artwork, employed new gas turbine and azipod technology. 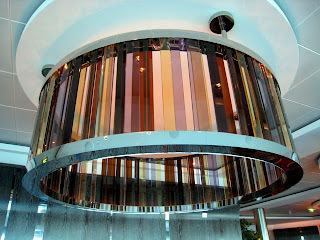 The quartet featured some striking architectural elements and interiors that still dazzle. In effect, they were grander, more advanced CENTURY-class ships with balconies. And then, after a long hiatus, came the 122,000 gt SOLSTICE in late 2008, the first of five (EQUINOX — 2009, ECLIPSE — 2010, and two as of yet unnamed (SOLARIS, anyone? 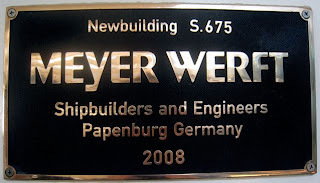 — 2011, 2012) newbuilds from Papenburg, Germany-based Meyer Werft. Early renderings revealed a curiously angular ship with two slim funnels placed far aft, courtesy of Martin Francis of Francis Design, a renowned architect of sailing and motor yachts. As in days of yore, the hull form was tested in simulators with an 18 foot model for stability, maneuverability and efficiency. The bow was designed to minimize drag while the longitudinal center of buoyancy was moved forward to work in conjunction with the interceptor at her stern to ensure maximum water flow to her twin pods. 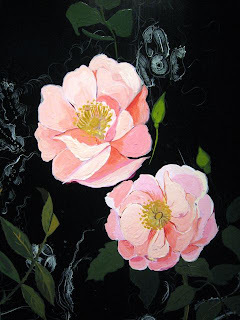 Far from traditional or ordinary, the SOLSTICE was imposing and eye-catching, demanding repeated and closer examination. 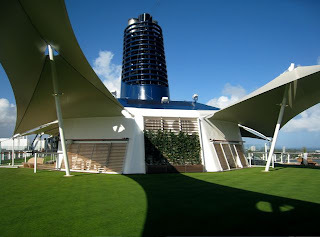 Interesting bells and whistles like the Lawn Club and Glass Blowing Show created the necessary cruise industry titillation but it was the temple-like configuration of the midships pool area laid out under the “altar” of the atrium shell and a canopy of cantilevered screens, acres of silver solar panels, the exaggerated “curl and swoop” of the funnel fins, the dynamic, multi-faceted superstructure and sheer diagonal afterdecks that affirmed the SOLSTICE was not just any other mega ship. Pre-“X”isting conditions. Photo and copyright Oliver Mueller 2008. “X” appeal. Photo and copyright Oliver Mueller 2008. 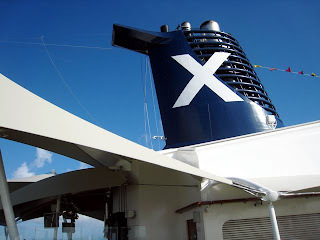 Initial artists’ impressions showed the ship with a pale blue livery and unadorned funnels with a large “X” (the Greek “Chi” logo from original parent company Chandris Lines) configured in the glassworks of her midships balconies. 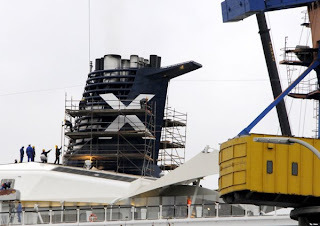 The pale blue ultimately reverted to Celebrity’s familiar midnight blue and after leaving her Papenburg builder’s yard and proceeding to Hamburg’s Blohm and Voss shipyard, the SOLSTICE’s forward funnel was bestowed with an “X” on either side. The aft funnel, not so. 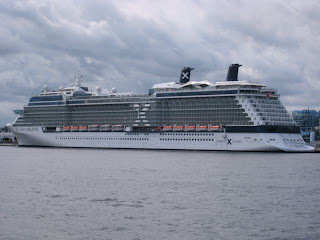 CELEBRITY SOLSTICE departs Hamburg for the first time. Note the “interceptor” at her stern waterline. Photo and copyright Oliver Mueller 2008. 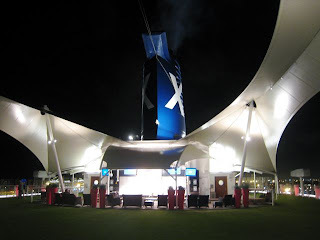 CELEBRITY SOLSTICE at Fort Lauderdale. 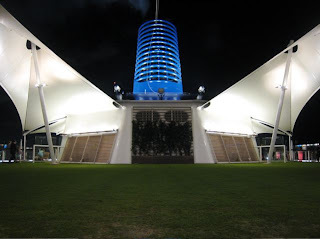 After the SOLSTICE’s 3 November arrival in Fort Lauderdale, the glass panels forming the “X”s were brightened up to make them more visible. 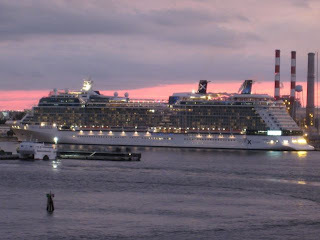 CELEBRITY SOLSTICE in the Fort Lauderdale twilight. The ship remained pierside for several days, then embarked travel agents and press for a series of two night introductory voyages. 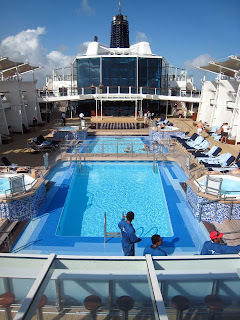 New Celebrity shipboard features like the aforementioned Lawn Club and Glass Blowing Show as well as the AquaClass cabin concept would be given a test run before the CELEBRITY SOLSTICE officially began her first cruise on November 23. 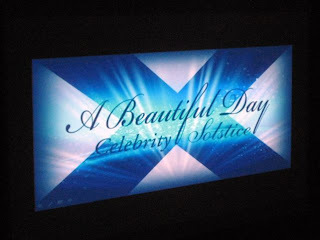 CELEBRITY SOLSTICE christening on screen. 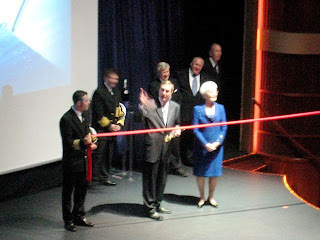 Godmother Sharon Smith prepares to cut the ribbon (with a little help from RCI CEO Richard Fain) at the CELEBRITY SOLSTICE christening. 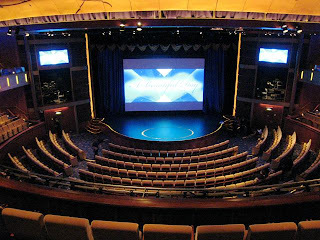 On 14 November 2008, the CELEBRITY SOLSTICE was christened by naturalist Godmother Sharon Smith in a ceremony attended by media and top producing agents in the ship’s Solstice Theater. 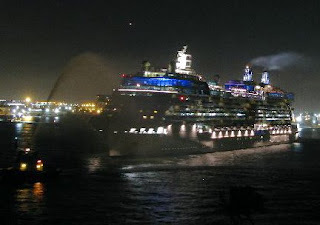 CELEBRITY SOLSTICE departs Fort Lauderdale on her first post-christening voyage. Photo and copyright Bill Hoey 2008. 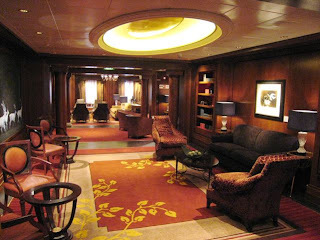 She departed that evening for a short gala cruise to nowhere, covered in detail in the Celebrating SOLSTICE Sea Treks Blog. 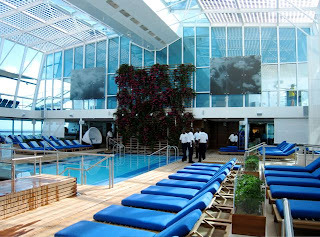 The CELEBRITY SOLSTICE has thirteen passenger decks, from top to bottom: Solstice, The Lawn Club, Lido, Resort, Penthouse, Sky, Panorama, Vista, Sunrise, Continental, Entertainment, Promenade and Plaza. 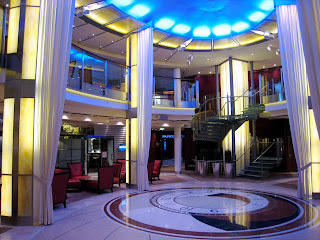 “Earth, Air, Light and Water” is the driving theme behind the ship’s design and decor. A vastly skilled and talented team, selected and supervised by parent company Royal Caribbean’s Executive VP of Maritime, Harri Kulovaara, is responsible for giving the SOLSTICE her cutting edge style. 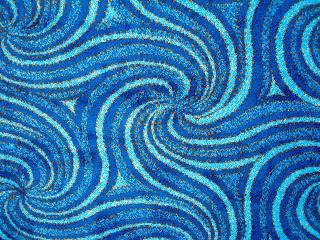 5+ Design: Fortunes Casino, Art Gallery, Galleria Boutique, Galleria Tastings are the company’s first sea-going commissions, inspired by the world’s most luxurious resorts. 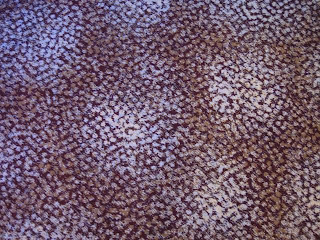 BG Studio International: Cellar Masters, Michael’s Bar, Murano, Ensemble Lounge, all of which feature rich and earthy colors and a trademark “Urbane Simplicity”. Francis Design: Hull and superstructure, inspired by sailing and motor yachts. 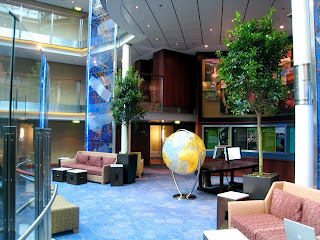 Royal Caribbean Cruises’ 30 member Newbuilding Design team: Blu, Martini Bar, all suites, teen and children’s areas, Library, Card Room, internet center, Team Earth with an overall goal of “cohesiveness”. 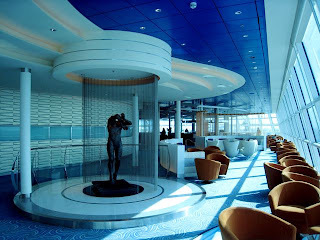 RTKL: Aqua Spa, Sky Lounge, Quasar, Silk Harvest, Cafe Al Baccio, passenger staterooms, with an eye for “ergonomics, comfort and soothing colors”. Wilson Butler and Associates: Lawn Club, Pool Deck, Solarium, Solstice Theater, Atrium, Foyer, Celebrity Central and Bistro On Five, devised to make the SOLSTICE a “breakthrough ship but with a natural flow like a well-designed city”. Starboard Solstice Deck, facing aft. 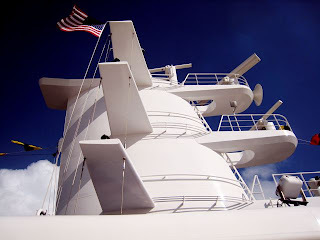 The radio mast, seen from starboard Solstice Deck, shares many of the same architectural elements as the aft-situated funnels. Aft from port Solstice Deck. Note solar panels atop the Solarium. A total of 61 panels with 216 foils contribute to the SOLSTICE’s power grid. Nearly all of the outer deck spaces have been designed by the Wilson Butler Architects firm, so there is a uniformity in both flow and appearance. 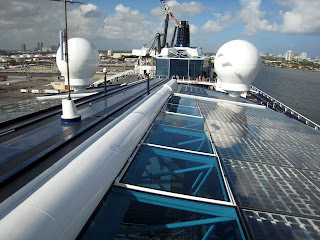 Partially sheltered by glass windscreens forward, the U-shaped Solstice Deck wraps itself around the mast housing on a structural island atop the forward portion of the ship. 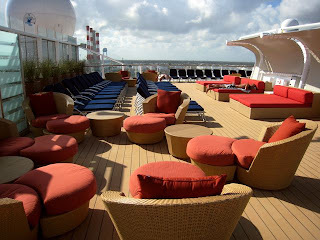 Cushioned lounge chairs and sunbeds share space with deck chairs. Over bow from forward Lawn Club Deck. Forward Lawn Club Deck, facing starboard. Forward Lawn Club Deck sports court. Forward starboard Lawn Club Deck, facing aft. Radio mast illuminated from port Lawn Club Deck. The XClub caters to age groups 13 — 15 and 16 — 17, known as the “AdmiralT’s”, providing video games, a teen disco and hangout. Fun Factory, facing forward from forward. Aft section of Fun Factory, facing aft. The Fun Factory caters to four age groups (Toddlers, Ship Mates — ages 3 to 6, Celebrity Cadets — ages 7 to 9 and Ensigns — ages 10 to 12). A myriad of activities is provided for each age group. 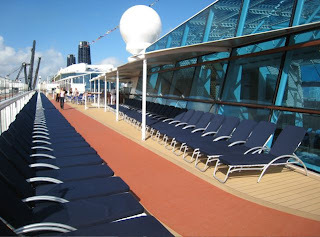 Lawn Club Deck is divided into fore and aft sections. 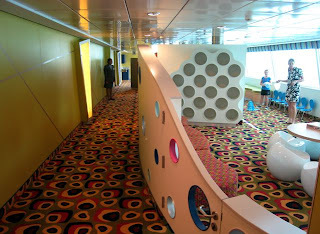 Up front, it contains an open observation platform overlooking the bow, a sports court and open terraces on either side of the XClub Teen Center to port and the Fun Factory children’s playroom, each designed by the RCI Newbuild team, to starboard. 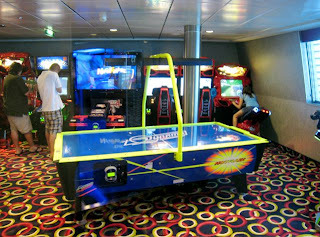 A video arcade is also located aft of the XClub on the port side. Facing forward from starboard Aft Lawn Club Deck. Starboard Aft Lawn Club Deck, facing aft. Forward funnel from starboard Lawn Club Deck. Aft Lawn Club Deck begins amidships at the base of the forward funnel housing. 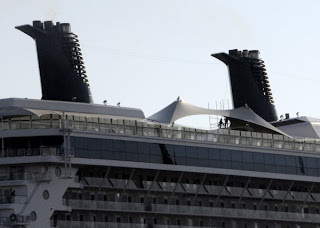 The twin funnels are beautifully sculpted structures with a generous curvature and long, whimsical wings that recall any number of recently departed favorite ships, from Celebrity’s own MERIDIAN (ex GALILEO GALILEI), to the ACHILLE LAURO (ex WILLEM RUYS), REGENT SEA (ex GRIPSHOLM) and BRITANIS (ex MONTEREY). Corning Museum of Glass, facing aft. Hot Glass Show, facing forward. 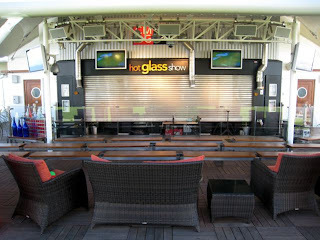 This area is home to two of the SOLSTICE’s most talked about new spaces, the Hot Glass Show and the Lawn Club, itself. The former is the brainchild of Celebrity President and CEO, Dan Hanrahan, who visited a glass blowing studio in Vermont and thought such a venue would lend itself well to the newbuilding SOLSTICE. 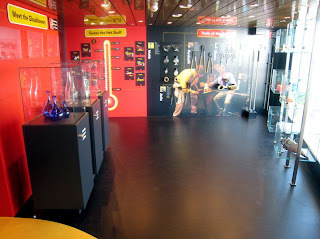 The shows give insight into the actual art of glass blowing while incorporating themes inspired by the places (such as the Caribbean and Mediterranean) that the ship visits. The glass makers are chosen by the Corning Museum of Glass, which also has an exhibit adjacent to the venue. Lawn Club lawn, facing aft. Lawn Club lawn, facing aft at night. Lawn Club lawn, facing forward at night. Lawn Club lawn, facing forward. 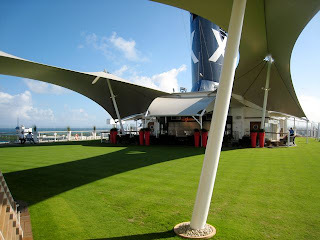 Situated under soaring, winglike canvas shades, the half acre Lawn Club was originally going to be open deck with green astroturf surfacing but evolved into a “live” grass concept after a bit of experimentation. A dozen species of grass were tested for sun, wind and sea exposure as well as foot traffic endurance. 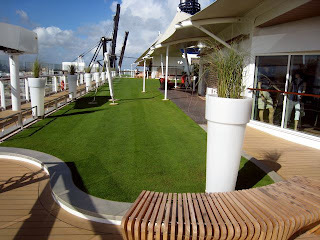 A multilayer cushion of growing media, filters and an irrigation system separates the Agrostis Stolonifera L93 (center field) and Agrostis Stolonifera and Festuca 20/80 (port and starboard extensions) from the steel decking. Providing the ambiance of a genuine country club, the grass is mowed every 1 to 3 days and kept at a height of between 10 and 15 milimeters. Putting, croquet and various activities are encouraged but no high heels, deck furniture and towels are allowed. Aft starboard Lawn Club Deck, facing forward. Could that be the combined Agrostis Stolonifera and Festuca 20/80 sod combination at right? 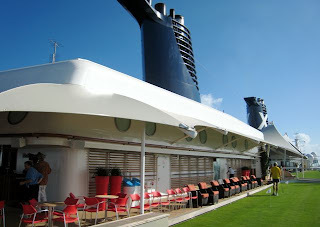 Aft Lawn Club Deck, facing port. 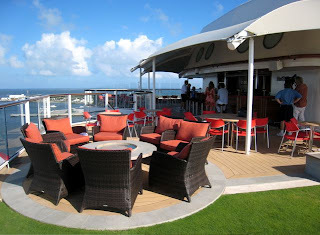 At the aft end of Aft Lawn Club Deck, overlooking the ship’s terraced stern and wake, is the sheltered, al fresco Sunset Bar (Wilson Butler Architects). Over bow from Sky Observation Lounge. 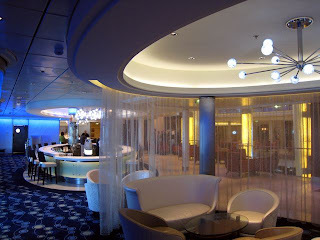 Sky Observation Lounge, facing port. 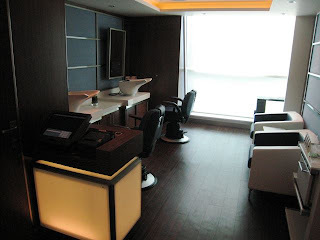 Sky Observation Lounge, facing forward from starboard. 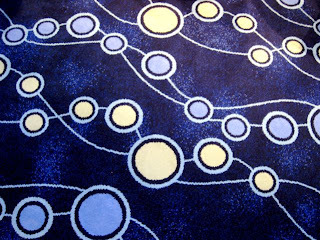 Totally Random Sky Observation Lounge carpet shot. 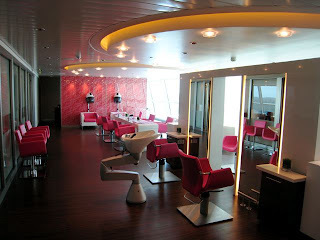 The Sky Observation Lounge (RTKL Associates) is what all observation lounges should be. The tall, angled windows provide spectacular, unencumbered views over the bow, on either side and up into the sky, itself. 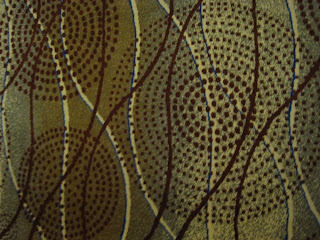 Its soothing palette is pure white, silver, deep blues and aqua with the occasional earth tone complement. 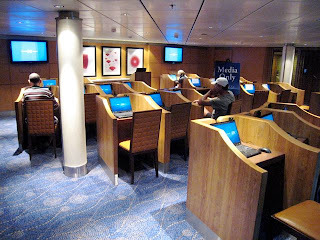 Textured modern surfaces adorn the bulkheads and screens as well as the ceiling. 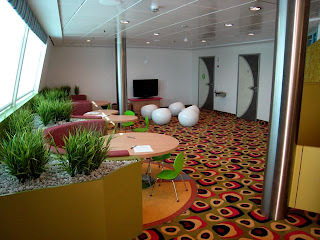 Key focal points are the “Dancer” sculpture at the aft/starboard entrance and the Arne Jacobsen “egg shell” chairs in the perimeter of the dance floor. At night, fiberoptic stars appear overhead to enhance the music and create a thematic “open sky”. On the port side and aft, there is the Sky Conference Center (not shown). 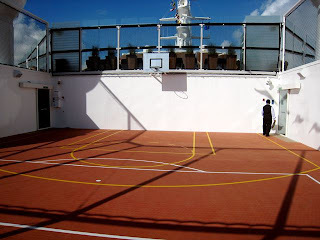 Forward starboard Lido Deck, facing aft. 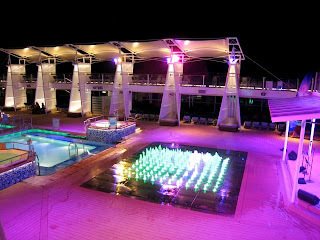 Aft from Midships Lido Deck. 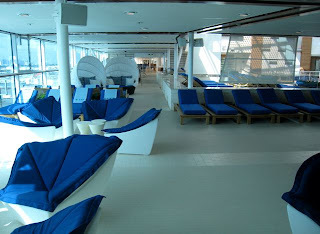 Starboard Lido Deck, facing aft. 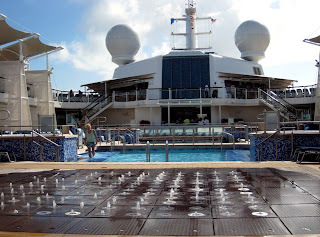 Facing port from midships starboard Lido Deck. 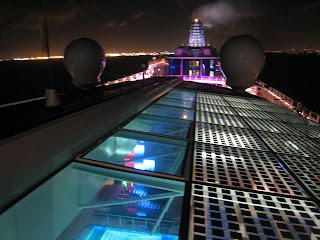 Facing starboard from midships port Lido Deck at night. 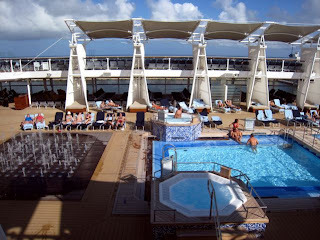 Lido Deck continues externally with a jogging track and sunning terrace that encircles the Solarium, pool and fountain areas. On either side of the pools are distinctive shade mechanisms. 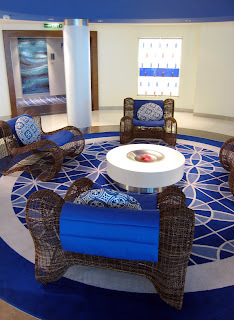 The pool area, decoratively inspired by the Greek Islands, is in varying blue tiles, white, and tans. 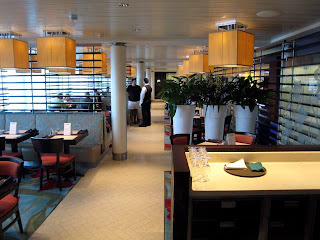 From the vantage of the Mast Grill (informal barbeque style offerings) or Bar on midships Lido level balcony facing aft past the bodies of water in its center, it has an almost Mayan or Egyptian architectural sensibility. Impressive from all angles. Oceanview Cafe facing aft from starboard. Oceanview Cafe serving stations, facing forward. 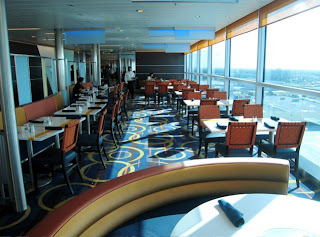 Oceanview Cafe, facing forward from aft/starboard. Inspired by “the casually chic atmosphere of a European marketplace”, the Oceanview Cafe (Tihany) dispenses with the notion that informal Lido Restaurants have to look inexpensive. 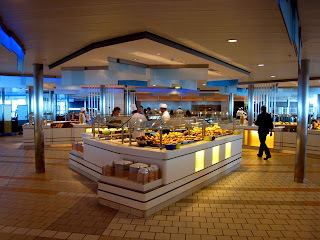 Action stations are laid out in its center, offering some of the best buffet style food afloat. 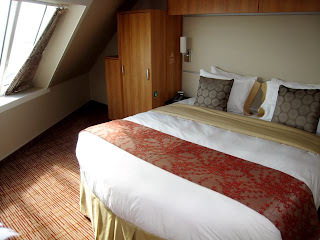 It is spacious and open and during my two nights on board seemed to have a good flow. Decoratively, it is a most sophisticated space with warm colors offset by clean, stark sufaces and a wide expanse of windows. 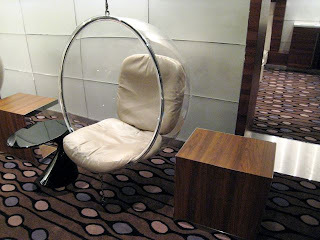 Certain sections even have large arm chair seating. 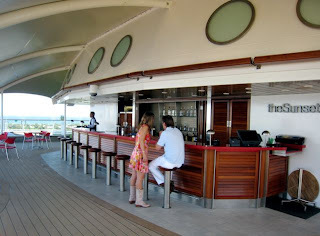 Overlooking the stern, there is al fresco seating by the Oceanview Bar (not shown). 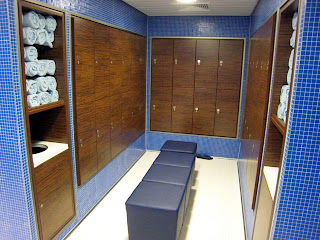 Aqua Spa men’s changing room. Waiting area rotunda, facing port. 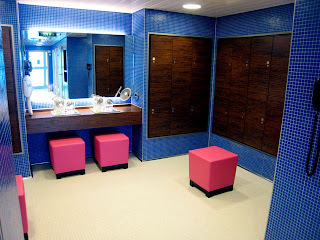 Aqua Spa, women’s changing area. 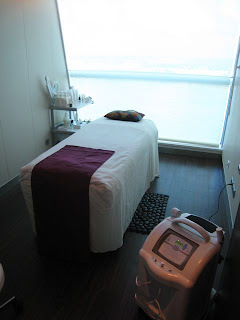 Aqua Spa treatment room, facing port. 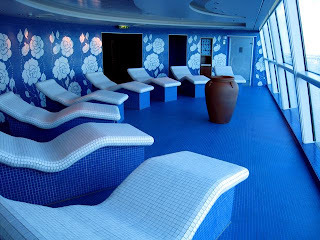 The Aqua Spa (RTKL) is located on forward Resort Deck. 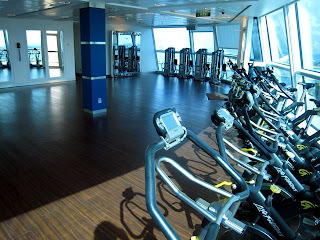 It begins with a nice open observation terrace (not shown) overlooking the bow and continues with a labryinth of leisure and luxury, including a separate aerobics area, a gym that can rival most land-based clubs, men’s and women’s changing areas, treatment and acupuncture rooms, the “Persian Garden” aroma therapy room, a beauty salon and barber shop. 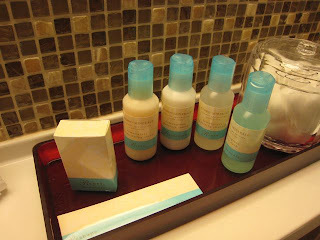 Acupuncture, Aroma Stone Therapy and tooth whitening are among the treatments offered by the Elemis-operated Aqua Spa. 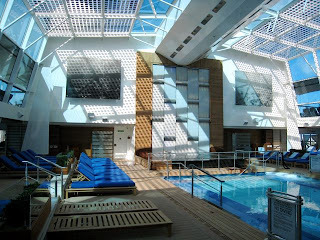 Solarium, facing aft from starboard. The all-weather adults-only pool and Solarium area follows the Aqua Spa on Resort Deck. 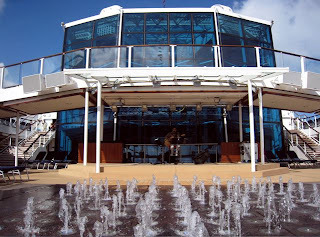 Enshrined in angular tinted glass and solar panels, the Solarium is possibly the most spectacular example of its type afloat, featuring a modernist waterfall sculpture on the aft bulkhead opposing a towering trelllis of bougainvillea forward, large art works, a sinewy fountain installation, a long pool and a sea of cushioned deck chairs. 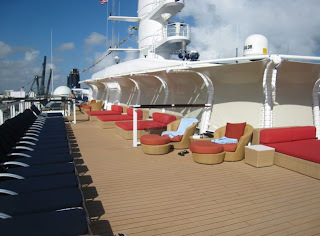 Midships Resort Deck, facing aft from port. Resort Deck pool area, facing forward. Wet Zone fountain, facing aft. Wet Zone fountain, facing forward. 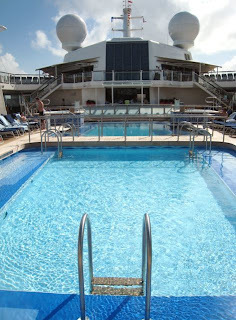 Midships Resort Deck contains a Sports Pool forward, followed by the Family Pool. 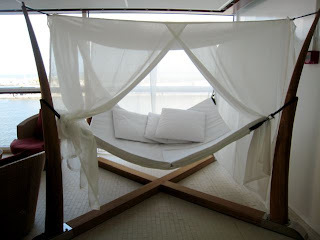 Cabanas are interspersed between the cushioned deck chairs and four hot tubs. At the aft end at the foot of a bandstand stage, is the intriguing Wet Zone fountain, which is “activated” by live music, shooting jets of water out of the deckhead in a similar fashion to celebrated fountains like that of the Dorothy Chandler Pavillion in Los Angeles’ modernist Music Center complex. 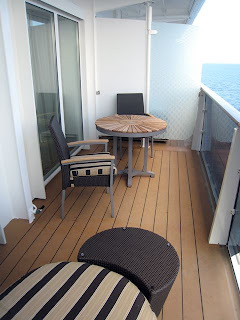 Resort Deck continues aft with a variety of S1, S2 and C1 accommodation. Penthouse Deck begins with the Aqua Spa Relaxation Lounge (not shown) overlooking the bow. It continues aft with Aqua Spa accommodation and a limited selection of Penthouse, Royal, Celebrity and Sky Suites in addition to S1, S2, C1 and O9 cabins. 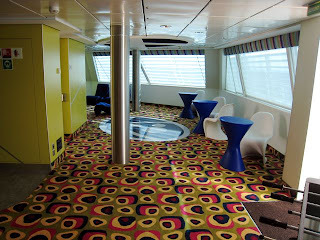 The upper level of the two deck Library can also be found on Penthouse Deck overlooking the forward edge of the Atrium. Atrium, facing up from the Library. A-tree-um, facing down from Library. 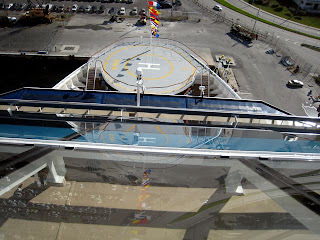 Sky Deck begins with the Bridge area and continues aft with accommodation, including Royal, Celebrity and Sky Suites as well as C1, C2 and 09 cabins. 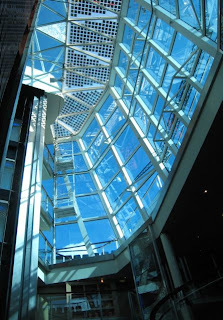 The lower portion of the double deck Library is located on the forward Atrium balcony on this level. 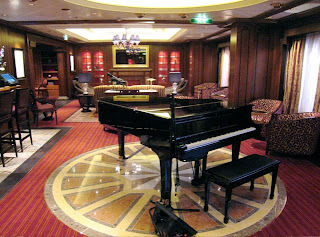 Celebriity ships have traditionally had impressive libraries and this one, designed by RCI’s Newbuild team, makes the grade. 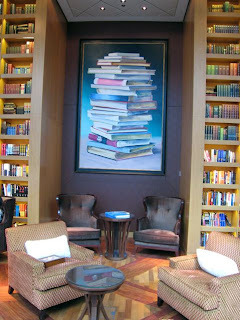 The centerpiece is a double deck oil painting called “Books” by German artist, Cornelius Volker. Vertiginous views are afforded from the balcony, either up through a tiara of glass or overlooking the suspended ficus tree centerpiece in a specially-designed, U.S. Coast Guard-approved vase. 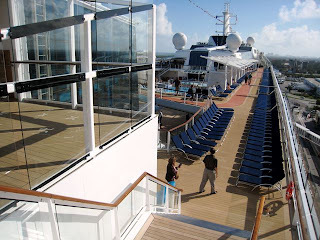 Panorama Deck begins with officers’ accommodation, continuing aft with passenger accommodation, including Sky Suites and a vast number of C1, C2, 1A, 1B, 09 and 10 cabins. On the forward Atrium balcony is the Card Room (RCI Newbuild team). Vista Deck is dedicated to passenger accommodation, including Sky Suites, Family Ocean View Suites, SV, 1A, 2A, 07, 09 and 10 category cabins. 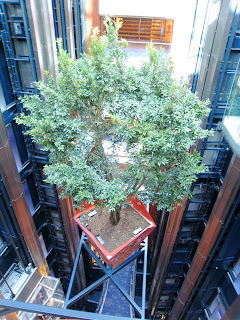 On the forward atrium balcony is the upper level of Team Earth. 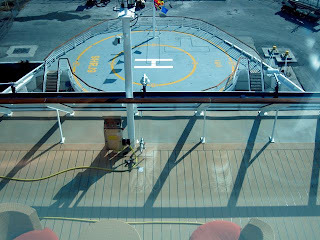 Sunrise Deck begins at the SOLSTICE’s fo’c’sle head helipad, which is crew area. 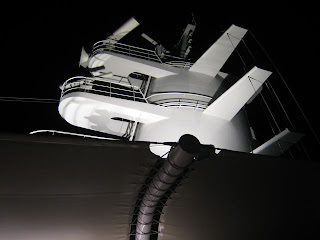 Nonetheless, it offers a striking view of the ship’s Wagnerian forward superstructure, which appears to have a 45 degree backwards slant, like say, half of an “X”, to complement the 45 degree forward slant of the afterdecks. Team Earth is a space dedicated to celebrating the value of marine life around the world. Interactive displays highlight endangered species and offer insight toward their preservation and the conservation of the seas. Designed by the RCI Newbuild team with the support of Conservation International. On Line At Celebrity, facing forward. Atrium, facing forward from Continental Deck level. Continental Deck is devoted to passenger accommodation, including S1, SV, 1A, 2B and 2C cabins. On the forward Atrium balcony, On Line At Celebrity (designed by the RCI Newbuilds team) features an arsenal of computers for on line access. 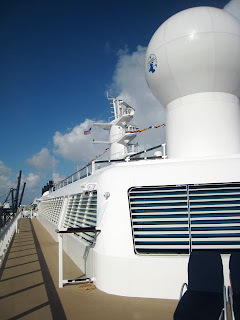 Port Entertainment Deck promenade, facing aft. 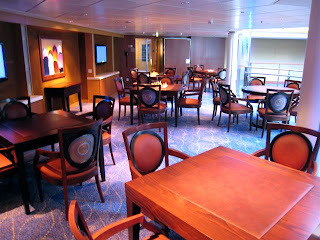 Entertainment Deck is devoted entirely to the SOLSTICE’s public spaces, some of which set a new benchmark for passenger ship interior design. Unfortunately, even the SOLSTICE is not perfect, and the two finite (no wrap around here for long strolls in the sea air) promenades on this level are mostly obscured by the boats. 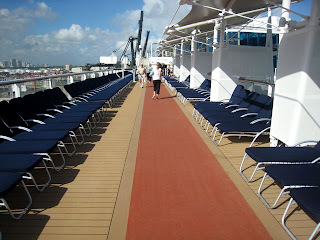 There are small open platforms on either side aft that tend to attract smokers needing a nicotine fix. Otherwise, not much to see or do here except muster for boat drill. Solstice Theater, facing forward from Entertainment Deck level. 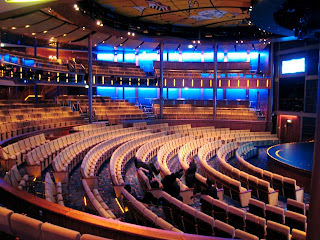 Overall excellent sightlines on three levels, a semi-theater-in-the-round stage that projects 20 feet from the proscenium and a galaxy of technical effects (including acrobatic suspension devices, telescopic orchestra pit, revolving props, and all the latest light and sound engineering) comprise the 1,115 seat Solstice Theater (designed by Wilson Butler), the upper portion of which begins the suite of public rooms on Entertainment Deck. Three main shows have been introduced here: “Solstice” (a European-influenced Cirque act that revolves around a celestial celebration), “Ghost Light” (featuring Broadway favorites) and “Pulse” (rhythmic vocal and dance performances). Entertainment Court, facing forward from Entertainment Deck level. 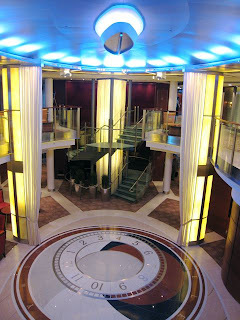 Just beyond the forward vestibule is a balcony overlooking the Entertainment Court on Promenade Deck, continuing on the port side with a photo gallery (not shown) and on the starboard side with the Galleria Boutiques (also not shown). 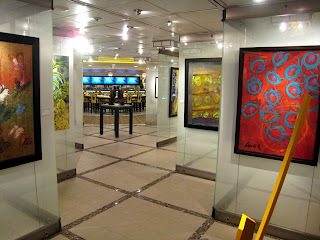 Inboard of the Galleria Boutiques and the Photo Gallery is the impressive Galleria Art Gallery with a number of eye-catching, often provocative and always interesting works culled by International Corporate Art (ICArt). 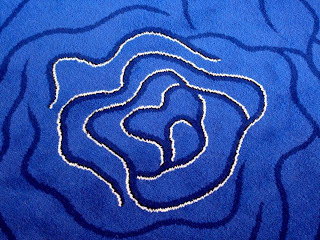 On the SOLSTICE, there are 4,750 pieces of original art worth USD 6 million. The extra tariff Galleria Tastings (5+ Design) is inboard and aft of the Galleria Art Gallery, an informal venue for warm and cold antipasti and potent potables. Bistro counter, where crepes are born, facing forward. Bistro On Five, facing aft. Bistro On Five, facing forward. 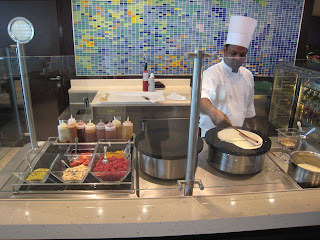 Overlooking the Grand Foyer on the port side, the Bistro On Five is an extra tariff creperie with a light menu of delicious selections that include sweet and savory crepes, salads and sandwiches. Japanese lanterns and slatted screens give it a hip, almost sushi bar sensibility, courtesy of Wilson, Butler and Associates. Cafe Al Bacio, facing forward. 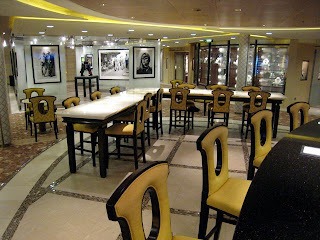 Meanwhile, on the starboard side of the Entertainment Deck level of the Grand Foyer, caffeine and crowds buzz at Cafe Al Bacio and Gelateria. Designed by RTKL, this space is a 180 degree stylistic turn from the cool blues and clean sweep of their Sky Lounge and Aqua Spa. Instead, it is a cozy cafe inspired by Viennese Coffee Houses with lime green wingback chairs, Victorian carpet with warm wood and beige accents. Don’t miss the complimentary mini-chocolates available here, btw. 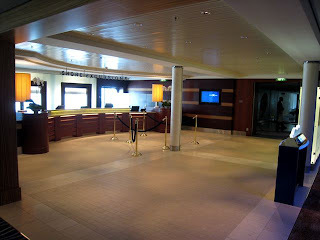 Beyond the midships foyer on the port side is Celebrity Destinations, the future cruise booking desk. Ensemble Lounge entryway, facing port. 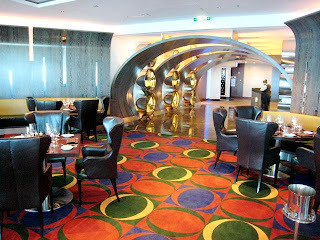 On the starboard side, a line up of several of the CELEBRITY SOLSTICE’s most decoratively spectacular venues begins with the Ensemble Lounge entryway, a most intriguing space that is part passageway and part art installation. 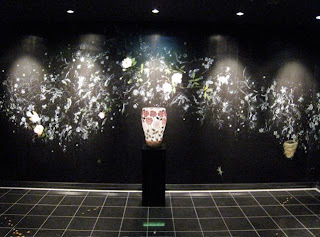 Piped-in sound effects mimic running water while hand painted flora and fauna (“Night Solstice” by Columbian American artist, Nancy Friedemann) crawls, flies and blooms across the bulkheads, ceiling and floor. 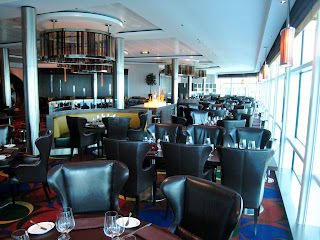 The Ensemble Lounge, designed by BG Studio International, stretches aft along the starboard side of Entertaiment Deck, providing access to Michael’s Club and the posh, extra tariff Murano Restaurant on its port side as well as the aft-situated Aqua Spa class Blu Restaurant, the extra tariff Silk Harvest Restaurant and the extra tariff Tuscan Grille. 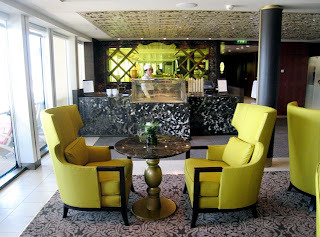 A destination unto itself with a long, centrally-placed bar, high back chairs and a rich, bold palette of walnut, magenta and gold, it achieves the designers’ intended “vibrant jazz lounge” feel. 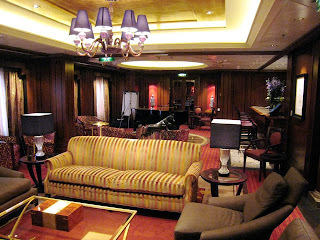 Fittingly, the L-shaped Michael’s Club (also by BG Studios), accessed from the forward portion of the Ensemble Lounge, has a similarly rich decorative ambiance with mahogany wood tones, recessed ceiling lighting and a soft palette of gold, beige and crimson. Think pianist, jazz and cognac. And, if the blown glass chandeliers aren’t actually Murano, well, the next room is. 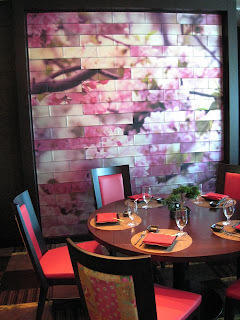 Murano, private dining room, facing forward. Inspired by the piazzas of Venice, the extra tariff specialty restaurant Murano serves a blend of classic and modern cuisine. Decoratively, it is a world-class venue with walnut, black lacquer, golden silk, beige and deep brown fittings, courtesy of BG Studios. 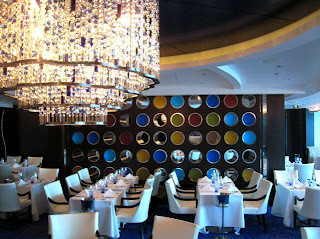 Blown glass chandeliers preside over ocean views, tables set with Riedel stemware, bone china and polished silver. 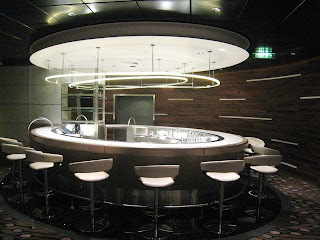 It is one of the spaces on everyone’s short list of favorites, a winner among the many top notch venues aboard the SOLSTICE. 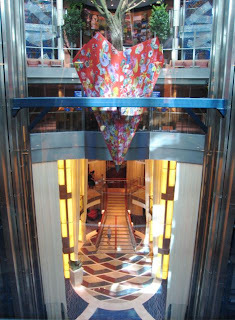 Entertainment Deck heart art by Jim Dine. 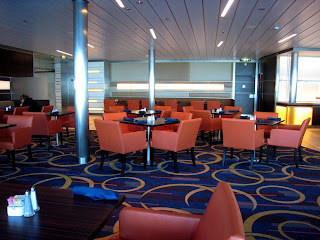 The “neighborhood” of dining venues and sophisticated lounges continues all the way aft on Entertainment Deck. 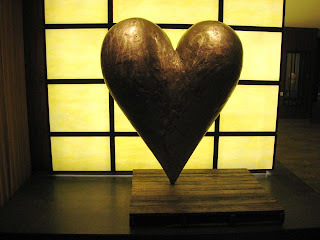 In the starboard foyer, there is a large bronze heart sculpture entitled “The Heart Called Orchid” by Jim Dine, whose work can also be found on ships of the MILLENNIUM and CENTURY class. 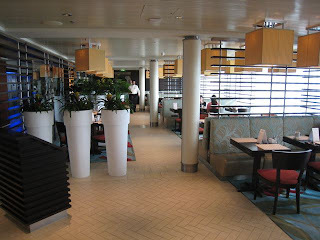 The extra tariff Silk Harvest Restaurant is on the starboard side of aft Entertainment Deck. According to it’s designer, Greg Walton of Miami-based RTKL, it is meant to represent a “contemporary interpretation of Asia”. The bright panels of cherry blossoms are not actual photographs but rather lifelike paintings on the back of acrylic by German arist, Stefan Sehler. 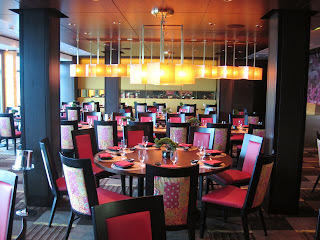 The menu is Asian fusion with Thai, Chinese, Japanese and Vietnamese specialties. Totally random Blu carpet shot. 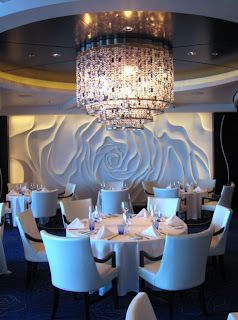 Without a doubt, one of the most beautiful rooms afloat, Blu is a specialty restaurant reserved for Aqua Spa passengers, and, when space permits, suite guests for a $5 service fee. Designed by RCI’s Newbuilding Design Team, Blu is an elegant tribute to the best of Midcentury Modern design, oozing a first class ocean liner ambiance and a wonderfully restrained palette of blue and ivory with islands of vivid color. 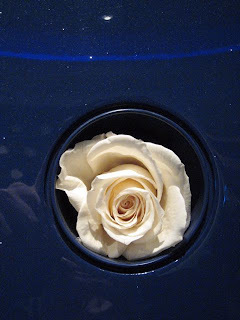 Dozens of roses fill the sockets in the deep blue enameled entryway, while moulded white roses form two of the room’s exquisite bulkheads. The menu features health-conscious “clean cuisine”, including various Mediterranean specialties and light entrees such as blackened tuna. Tuscan Grille and entryway, facing forward. 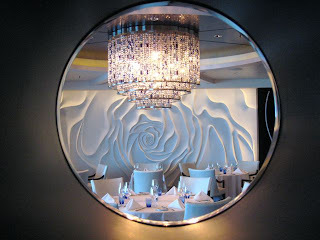 Just beyond an entryway inspired by a Napa Valley wine cellar, the extra tariff Tuscan Grille concludes the specialty dining “neighborhood” of CELEBRITY SOLSTICE’s aft Entertainment Deck. 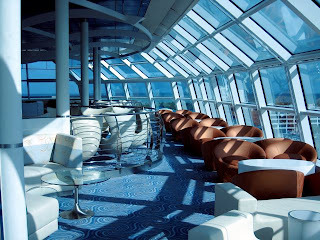 Its panorama of windows overlooks the ship’s wake and the decor is Midcentury influenced with bright primary colors and oversized circular chandeliers reminiscent of those on board the famed Italian liner MICHELANGELO. 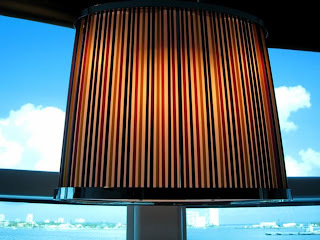 According to it’s designer, Adam Tihany, “A good restaurant that serves pasta and steak cannot fail”. It doesn’t hurt to throw in excellent food, gracious service, comfortable leather arm chairs and a spectacular view of the sea. 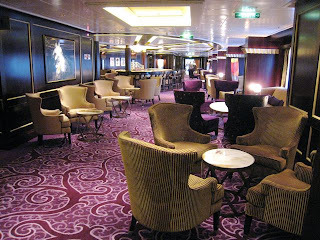 Promenade Deck level begins with the second tier of the Solstice Theater, followed by the forward vestibule. 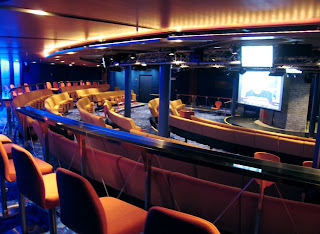 Just beyond that, on the starboard side, is Celebrity Central, which like the Queen’s Lounge on Holland America ships serves as a second entertainment venue, cinema and high tech TV studio (for things such as cooking demos, etc.). Designed by Wilson Butler and Associates. 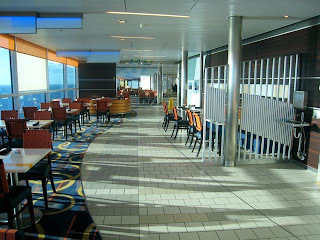 Entertainment Court, facing forward from Promenade Deck level. 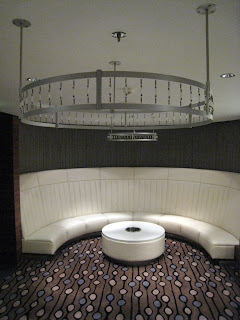 Celebrity Central is accessed via the Entertainment Court, which serves as an elegant second lobby space where one might encounter a string quartet or barbershop trio enroute to the shops or a show in the Solstice Theater. It was designed by Wilson Butler, as well. Quasar, facing starboard from aft. 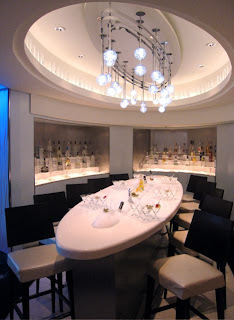 The Quasar Bar is the SOLSTICE’s dedicated nighclub, a pulsating, futuristic venue that is part Sci-Fi, part South Beach. The outer forward facade (not shown), was inspired by a James Bond Aston Martin, according to an RTKL designer. Shops On The Boulevard, facing forward. 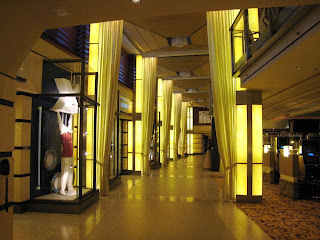 Shops On The Boulevard connect the Entertainment Court with the Grand Lobby. 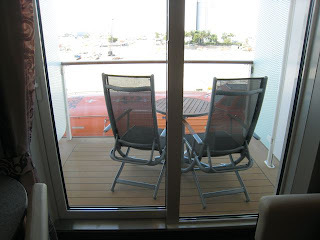 On the port side, natural light filters in through windows on Entertainment Deck, above. Designed by 5+ Design, who also did the adjacent Fortunes Casino. Located on the starboard side of the Shops On The Boulevard, it is a state of the art casino from the team that brought you the Bellagio in Las Vegas. 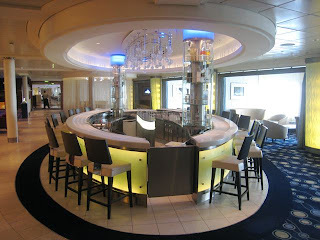 The forward portion of the chicly cool Martini Bar, which occupies the port portion of the Promenade Deck Grand Lobby balcony is Crush, a dedicated vodka and caviar cranny. Totally random Martini Bar carpet shot. The Martini Bar is another gorgeously appointed Midcentury-influenced space by the Royal Caribbean Newbuild Design team in cool blues, frosted glass and starkly pure white. 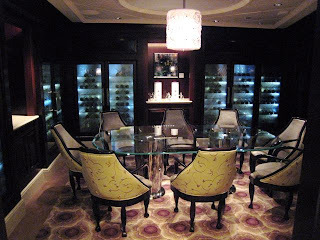 On the starboard Promenade Deck balcony overlooking the Grand Lobby is CellarMasters, a warm, richly-hued space dedicated to “all things wine as a social experience”, according to a BG Studios designer. 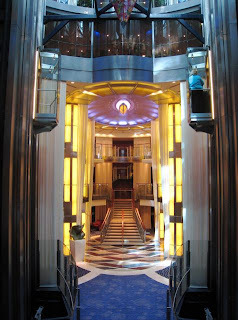 Atrium, facing forward from Promenade Deck level. 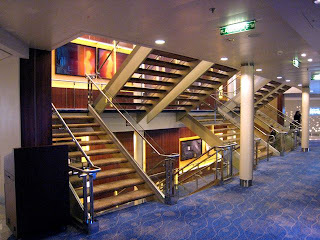 Midships Promenade Deck stairtower, facing port. With all the amazing artwork in the stairtowers, one wonders if gazing art connoisseurs often block the vertical passenger flow. An entire week would be required to fully appreciate all the artwork on the SOLSTICE. There is nothing generic about this ship! 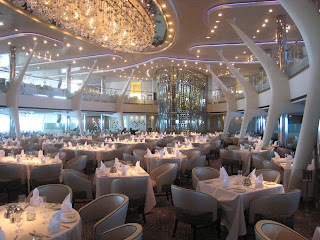 Port Promenade Deck level Grand Epernay entree. 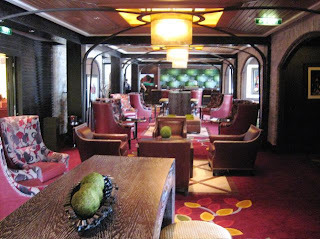 Grand Epernay, facing aft from Promenade Deck level. 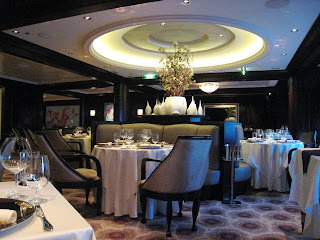 Adam Tihany’s magnificent Grand Epernay main dining venue concludes the Promenade Deck passenger spaces. 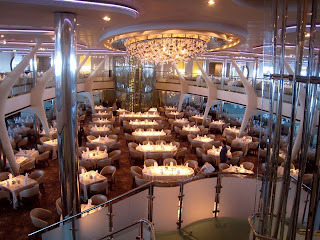 An “event”, indeed, the space soars out of a Busby Berkeley set with its ribbed support columns, elliptical ceiling fixture, plexiglass and steel wine cellar (that looks like a protruding ship’s bow), grand staircase and restrained palette of beige, bone and brown, enhanced with cool fiberoptics and, in daytime, abundant natural light. 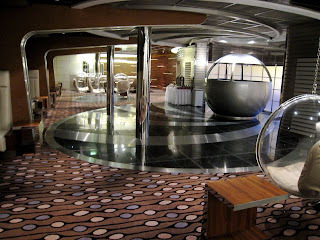 It is a truly awe-inspiring venue, one of many highlights on board a ship filled with superlative spaces. And, while it evokes the grandeur of a transatlantic liner, its true inspiration is the architecture of “Calatrava, the great bridge builder.” Bravo! Solstice Theater, facing port from Plaza Deck level. Plaza level begins with the lowest tier of the Solstice Theater, continuing aft with a block of Category 08 and 11 accommodation. 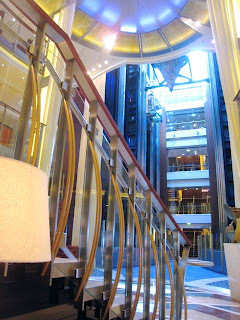 Grand Foyer stairs, facing aft from Plaza Deck. 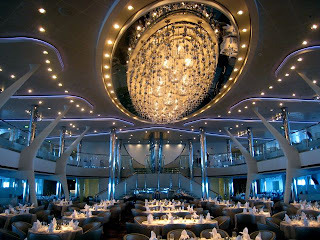 Midships Plaza Deck contains the three deck high Grand Foyer atrium, elegantly and loftily conceived by Wilson Butler Associates with their signature fixtures and enhanced fiberoptics. 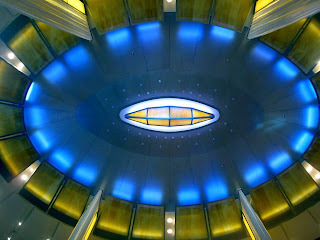 The ceiling is almost like a hovering space ship or, perhaps an incandescent sea creature from the darkest depths. 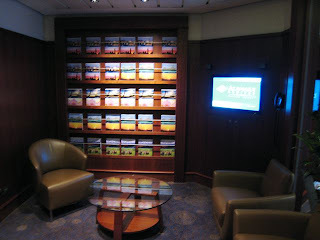 Guest Relations Desk, facing port. 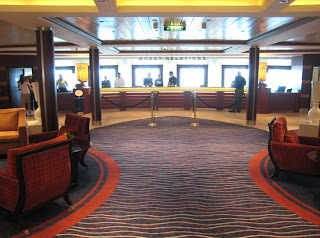 On the port side of the Grand Foyer is the Guest Relations Desk. 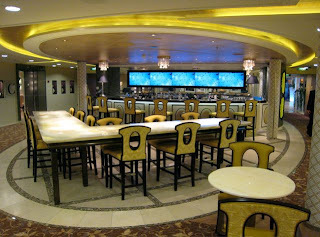 On the starboard side of the Grand Lobby, one finds the Passport Bar, designed by BG Studios to not only make a “vibrant first impression” but also to reflect “a confluence of arrivals and departures”. 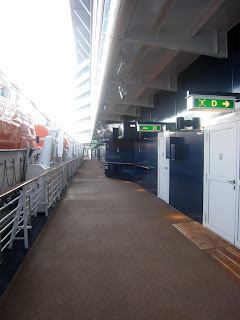 As a point of reference, the main entry gangway is located just aft aft, by the Shore Excursions Desk. Shore Excursions Desk, facing aft. 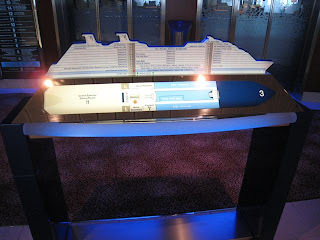 The Shore Excursions Desk is adjacent to the midships stairtower on the starboard side. 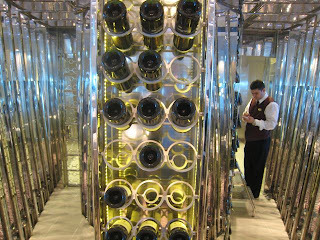 Grand Epernay, facing aft from Plaza Deck level. 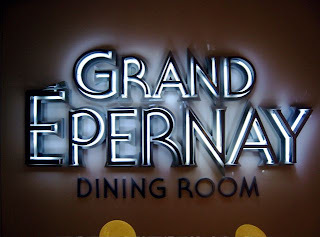 Grand Epernay, facing forward from port Plaza Deck level. 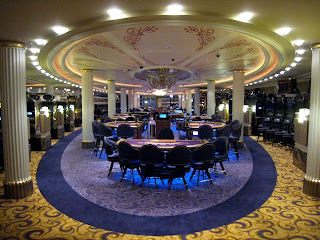 Grand Epernay, facing forward from Plaza Deck level. 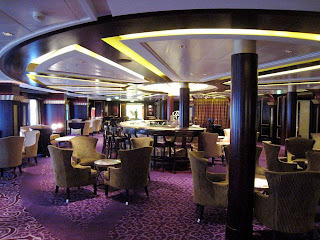 The Plaza Deck level of the Grand Epernay provides a fitting coda to this tour of the CELEBRITY SOLSTICE’s public areas, which conclude here. 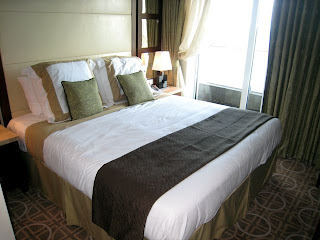 All of the CELEBRITY SOLSTICE’s staterooms contain the following: two lower beds convertible to a queen (with a few noted exceptions), direct dial telephone and voice mail, individually-controlled air conditioning, private safe, hairdryer, 100 percent Egyptian cotton sheets and towels, private bar, complimentary use of bathrobes and 24 hour room service, Mac minis with a 32-inch panel Samsung screen (offering Nanonation Comand Point software that allows passengers to book excursions, watch on-demand entertainment, preview menus and order room service). 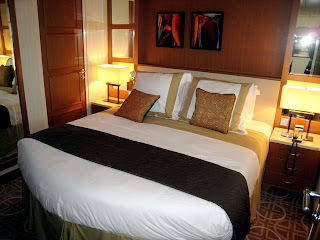 The overall stateroom look by RTKL (the suites are by RCI Newbuilds) is inspired by today’s most trendy boutique hotels, incorporating modular furniture, rounded beds, yacht-inspired headboards, a restrained palette of earthy colors and “sunset” toned accents. A team of five women ( a travel agent, a travel writer, a potential cruiser, a hotellier and a frequent cruiser) known as “The Leading Ladies” was consulted for their input on comfort and functionality. There are modular closets, higher beds for under bed storage, roll out pullmans for third and fourth berths, reading lights on each nightstand and safes large enough to accommodate laptops. 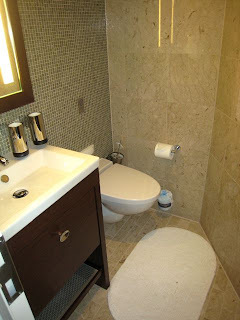 Bathrooms were conceived to be ergonomically-friendly, spacious and with plenty of storage. All showers even have a courtesy step bar for women to use while shaving their legs. The two 1,291 square foot Penthouse Suites on midships Penthouse Deck are the CELEBRITY SOLSTICE’s top accommodation category. They feature floor to ceiling sliding glass doors, separate living room with dining area, a baby grand piano, a queen sleeper, a full bar, lounge seating, surround sound entertainment via a 52 inch LCD television, vanity, walk-in closet, a marble master bath with whirlpool tub, separate shower with dual shower heads, double wash basins and a 26 inch LCD TV. 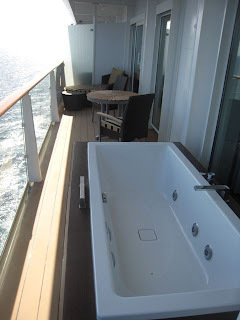 The 385 square foot verandahs have private whirlpool tubs. 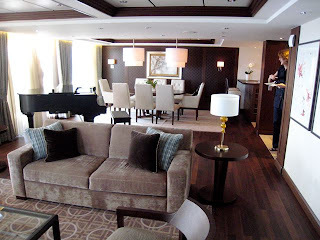 The eight 590 square foot Royal Suites are located on midships Penthouse and Sky Decks. They feature floor-to-ceiling sliding glass doors, separate living room with dining area, queen sofa sleeper, lounge seating, a wet bar, surround sound entertainment with a 52 inch LCD television, powder room, 153 square foot verandah with whirlpool and lounge seating, queen sized bed, 40 inch bedroom LCD television, vanity, walk in closet, master bath with whirlpool tub, separate shower stall. Twelve Celebrity Suites on Penthouse and Sky Decks feature floor to ceiling sliding glass doors, living room with sectional queen sofa sleeper, lounge seating, mini refrigerator, surround sound entertainment system with a 52 inch LCD television, vanity, 40 inch LCD television in bedroom, second vanity, walk-in closet, dual access bath with shower/tub combination and wash basin, 105 square foot veranda with lounge seating. Forty Four 300 square foot Sky Suites (categories S1 and S2) are located on Penthouse, Sky, Panorama, Vista, Sunrise and Continental Decks. They feature floor to ceiling sliding glass doors, living room with queen sofa sleeper, mini-refrigerator, 40 inch LCD television, vanity, bath with shower/tub combination and washbasin and 77 square foot veranda with lounge seating. 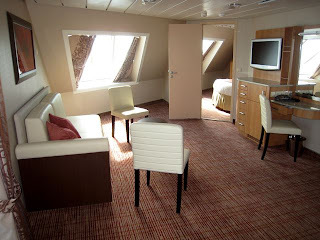 Family Ocean View Stateroom With Veranda, facing forward. 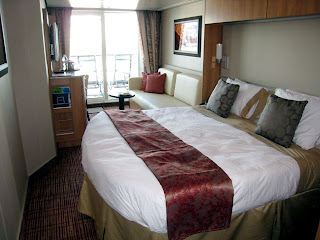 Family Ocean View Stateroom With Veranda bedroom. 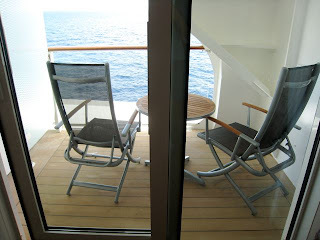 Family Ocean View Stateroom With Veranda veranda. 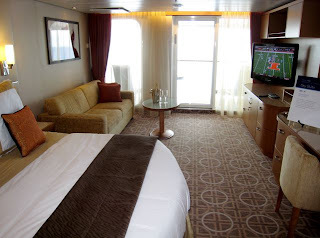 Four 575 square foot Family Ocean View Staterooms With Veranda are located in the forward corners of Vista and Sunrise Decks. They feature floor to ceiling sliding glass doors, a sitting area with sofa convertible to trundle bed, a privacy partion, 32 inch LCD television, master bedroom, second bedroom with a twin bed and a 56 — 106 square foot veranda with lounge seating. 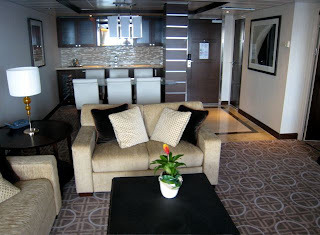 There are 130 AquaClass Staterooms located on Penthouse Deck with the same layout and facilities as Deluxe Ocean View Stateroom With Verandah (below) but with the following additional amenities: premium location near the Aqua Spa, bathrooms with five head Hansgrohe shower massage panels, personal spa concierge, complimentary access to the Relaxation Room and Persian Garden, complimentary dining in Blu, in cabin aroma scent selections, a pillow menu, complimentary spa oriented bathroom amenities, daily bottled water, juices and teas, use of Frette robes and slippers, light dimmers, Euro face towels, oversized towels, AquaClass room service choices and daily canapes. 192 square feet with a 53 square foot veranda with lounge seating. Double occupancy only. 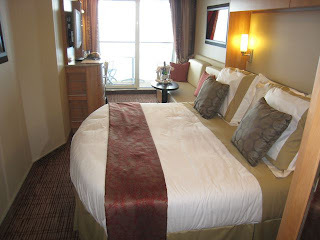 Deluxe Ocean View Stateroom With Veranda. 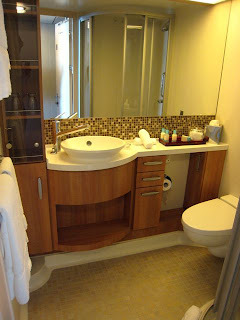 Deluxe Ocean View Stateroom with veranda bathroom. 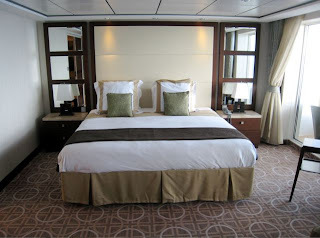 Deluxe Ocean View Stateroom With Veranda veranda. There are 719 Deluxe Ocean View Staterooms, 24 Sunset Veranda, and 273 Celebrity Concierge Class Staterooms, all of which are 192 square feet with a 52 square foot veranda. They all share the same blueprint, although Sunset Verandas overlook the stern and Celebrity Concierge Class rooms have concierge access. 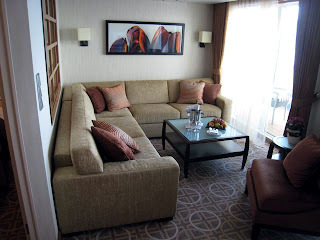 These rooms feature floor to ceiling sliding glass doors, sitting area with sofa, 32 inch LCD television and vanity. Some have a trundle bed. 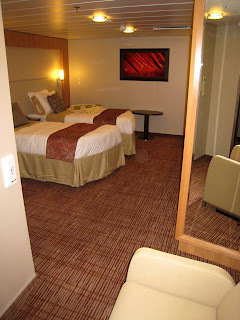 There are 70 Ocean View Staterooms measuring 176 square feet. 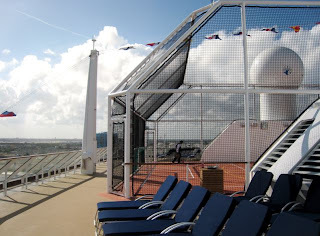 Category 07s are located on forward Vista and Sunrise Decks and Category 08s are located on Plaza Deck. 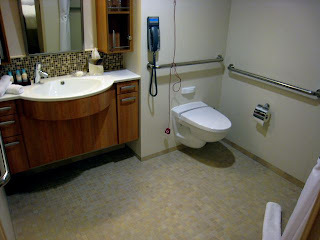 They feature a picture window, sitting are with sofa, 32 inch LCD television and vanity. Some have a trundle bed. 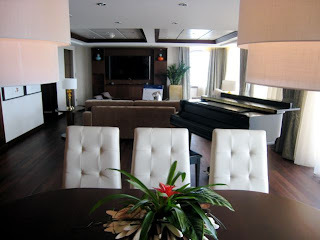 There are 140 Inside Staterooms in Categories 09, 10 and 11 on Penthouse, Sky, Panorama, Vista, Sunrise and Plaza Decks. They range between 183 and 200 square feet and feature sitting areas, 32 inch LCD televisions, vanities, and, in some, trundle beds. 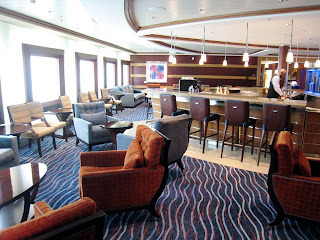 There are 30 Wheelchair Accessible Staterooms in the following categories: Sky Suites (4), AquaClass (4), Concierge Class (4), Deluxe Ocean View (8), Ocean View (4), and Inside (6). 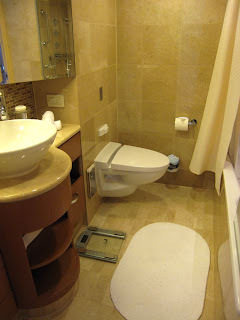 Access Staterooms feature wider doors, no doorsills, 5 foot turning radius, lowered closet rods, safes, vanity and are located near elevators. Where applicable, balconies are also accessible. 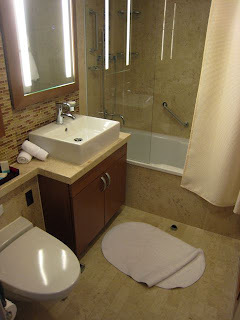 Access Stateroom bathrooms feature wider doors, ramped thresholds, 5 foot turning radius, grab bars, roll-in showers, fold-down shower bench, hand-held shower head, 17 — 19 inch high toilets, lowered sink. 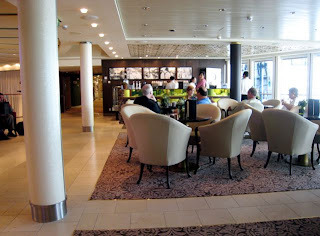 Very tastefully appointed, I love those chairs in the Gelateria facing aft. 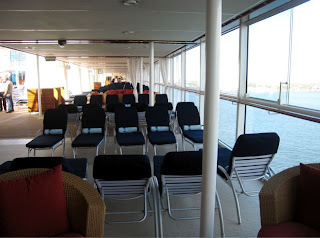 (Peter will you please make a note to save me one of these chairs when this vessel heads for Alang – thanks). These ships are being launched so fast I don’t know how you manage to cover them – and so well too.